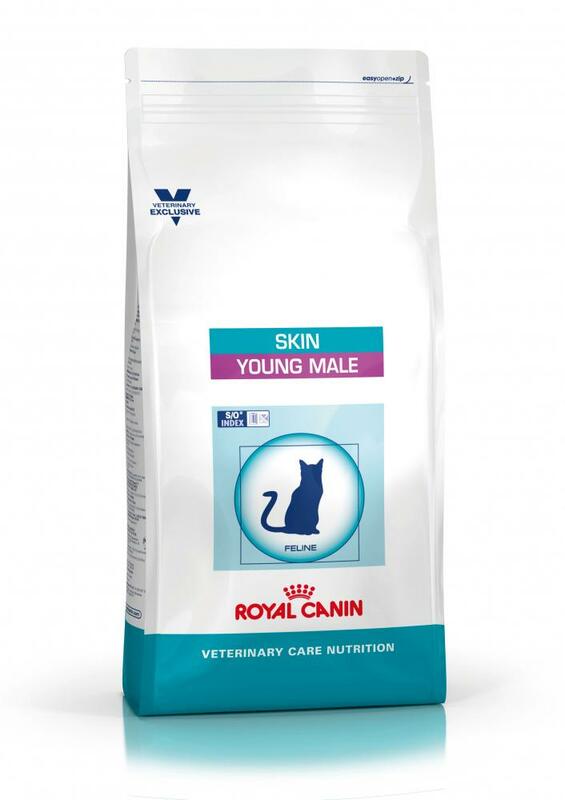 Royal Canin Neutered Skin Young Male is a complete food for male neutered cats with sensitive skin. It can be fed from neutering to the age of 7. It has been specifically developed by vets and nutritionists to meet the needs and common problems to neutered male cats. Sensitive skin will be helped with high levels of biotin, niacin and pantothenic acid combined with a zinc-linoleic acid. This will help to prevent transepidermal water loss and to strengthen the barrier effect of the skin. Neutered cats can be prone to becoming overweight and weight management is consequentially very important for them. The food contains L-Carnitine which helps to maintain muscles and reduce fat deposition. It is also high in protein which will ensure palatability and will maintain an ideal weight and body shape. The food will help to prevent urinary problems by increasing the urine volume. This will dilute the urine, reducing its saturation and help to prevent the formation of struvite or oxalate crystals. Dehydrated poultry protein, maize, wheat gluten*, maize gluten, rice, animal fats, hydrolysed animal proteins, vegetable fibres, beet pulp, fish oil, minerals, psyllium husks and seeds, soya oil, fructo-oligo-saccharides, borage oil, marigold extract (source of lutein). Vitamin A: 29400 IU, Vitamin D3: 800 IU, E1 (Iron): 38 mg, E2 (Iodine): 3.8 mg, E4 (Copper): 6 mg, E5 (Manganese): 49 mg, E6 (Zinc): 147 mg, E8 (Selenium): 0.08 mg - Preservatives - Antioxidants. There are currently no questions for Royal Canin Feline Vet Care Nutrition Neutered Young Male Skin Cat Food - be the first to ask one!